« Seattle meeting on Saturday December 10th 2016. A picture of Danna and John, and confirmation of the venue, date, and time. I am excited to announce a channeling event in the Seattle area for those who might be interested in learning to connect with their inner guidance, channel the Divine, or find some spiritual intuitive answers. 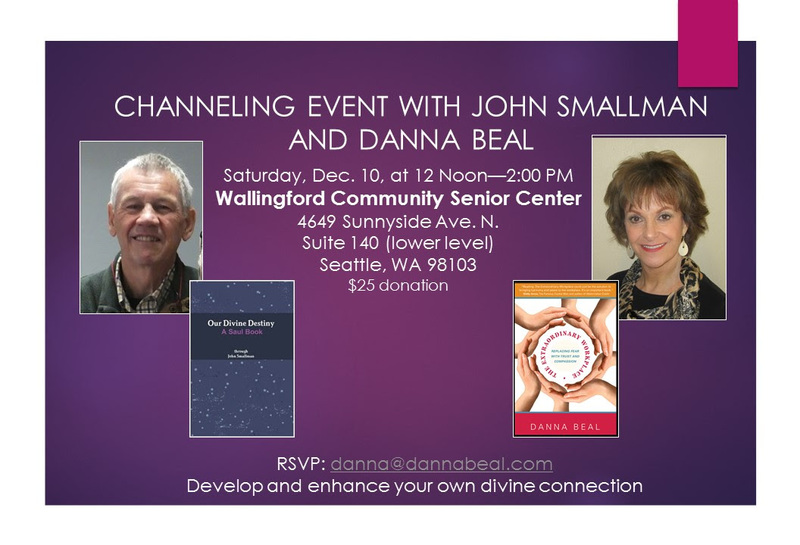 My friend, John Smallman, channel for Jesus through John and author of Our Divine Destiny, A Saul Book, will be in Seattle on Saturday, Dec. 10, from 12 PM—2:00 PM. John has thousands of followers throughout the world and has been channeling since 1995. He started posting his blogs in May, 2009. My Twelve Wise Ones have been dictating to me since 1981 and is the source and information that is the basis of my books, articles and international talks on spirit in business. Together, we will share our experiences and he will guide you through steps for illuminating your own inner guidance that is awaiting you. If you currently are receiving your own guidance but would like to enhance it, this may clarify your natural ability. So bring pen and paper. TO REGISTER-Either email me at danna@dannabeal.com that you are coming or click on the contact form that you are coming. We will let you know the address soon as we are confirmed. Or let John know on his blog. John was born in England, has traveled worldwide as an international pilot, is the father of three grown children and currently lives in New Hampshire. He leads A Course in Miracles class in New Hampshire and has taught channeling classes there. He has followers from all over the world who are reading his blogs with the beautiful messages from Saul and Jesus through John. John is also the author of Our Divine Destiny – A Saul Book. Danna lives in Bellevue where she is an author (The Extraordinary Workplace: Replacing Fear with Trust and Compassion), international speaker, workshop leader and coach. She has spoken to over 500 businesses on Replacing Fear with Trust and Compassion in the Workplace. To read more, you are invited to visit my visit my blog on shifting the consciousness in the workplace and the world. John and Danna – If you ever consider doing this presentation in Florida, I’d be happy to find a suitable venue for you here in Tallahassee. Another option would be to offer your Dec. 10th event as a webinar. I’d be more than happy to donate $25 (or more) for an opportunity to listen in on this pending event. Thank you, and be in peace.